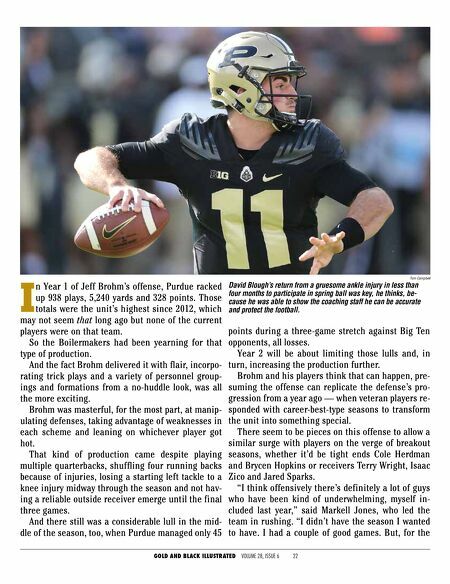 GOLD AND BLACK ILLUSTRATED VOLUME 28, ISSUE 6 22 I n Year 1 of Jeff Brohm's offense, Purdue racked up 938 plays, 5,240 yards and 328 points. Those totals were the unit's highest since 2012, which may not seem that long ago but none of the current players were on that team. So the Boilermakers had been yearning for that type of production. And the fact Brohm delivered it with flair, incorpo- rating trick plays and a variety of personnel group- ings and formations from a no-huddle look, was all the more exciting. Brohm was masterful, for the most part, at manip- ulating defenses, taking advantage of weaknesses in each scheme and leaning on whichever player got hot. That kind of production came despite playing multiple quarterbacks, shuffling four running backs because of injuries, losing a starting left tackle to a knee injury midway through the season and not hav- ing a reliable outside receiver emerge until the final three games. And there still was a considerable lull in the mid- dle of the season, too, when Purdue managed only 45 points during a three-game stretch against Big Ten opponents, all losses. Year 2 will be about limiting those lulls and, in turn, increasing the production further. Brohm and his players think that can happen, pre- suming the offense can replicate the defense's pro- gression from a year ago — when veteran players re- sponded with career-best-type seasons to transform the unit into something special. There seem to be pieces on this offense to allow a similar surge with players on the verge of breakout seasons, whether it'd be tight ends Cole Herdman and Brycen Hopkins or receivers Terry Wright, Isaac Zico and Jared Sparks. "I think offensively there's definitely a lot of guys who have been kind of underwhelming, myself in- cluded last year," said Markell Jones, who led the team in rushing. "I didn't have the season I wanted to have. I had a couple of good games. But, for the Tom Campbell David Blough's return from a gruesome ankle injury in less than four months to participate in spring ball was key, he thinks, be- cause he was able to show the coaching staff he can be accurate and protect the football.